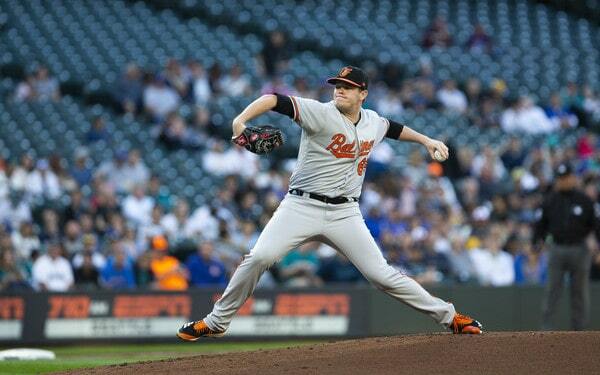 11:13pm ET: For the second time in eleven years the Yankees have acquired a Britton from the Orioles. 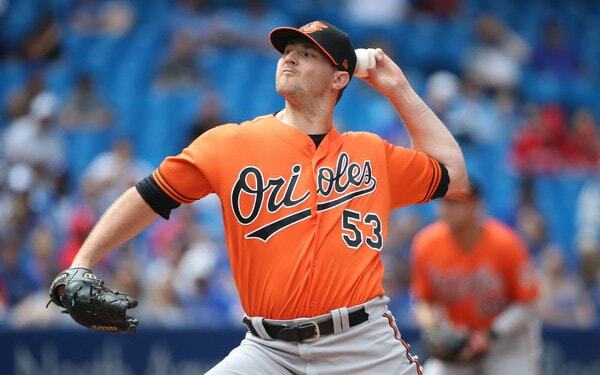 According to multiple reports, the Yankees and Orioles have agreed to a trade sending Zach Britton to the Yankees for pitching prospects Dillon Tate, Cody Carroll, and Josh Rogers. These two teams made the Jared Wright-for-Chris Britton trade back in 2007, you may remember. The present day Britton deal is not yet final, which is notable given the O’s stingy medical reviews. With Aroldis Chapman locked into the closer’s role, Britton will join a setup crew that includes Dellin Betances, Chad Green, and David Robertson. Jonathan Holder has started to see more high-leverage work as well. Handedness doesn’t matter with pretty much any of these guys, but it will be nice to have a lefty setup option. Simply put, Britton allows the Yankees to further shorten the game, which is an especially big deal come postseason time. The Yankees could go four-and-fly come October and throw power arm after power arm at their opponent. Let’s not get ahead of ourselves though. Gotta get there first. Also, Britton is a pretty great insurance policy in case Chapman’s achy left knee acts up again at some point. One other thing to keep in mind: The Yankees kept Britton away from the Astros and Red Sox, two potential postseason opponents. The Astros and Red Sox were both after him, as were other contenders like the Cubs, Dodgers, Brewers, and Phillies. I’m not sure how much keeping him away from the Astros and Red Sox helps, but it sure doesn’t hurt. Here is my Scouting The Market post on Britton. He returned from a torn Achilles last month and has generally looked better and better as he gets further away from the injury. Britton looks like a guy who’s been shaking off the rust following a long layoff, basically. He’s thrown eight scoreless innings in his last eight appearances, and both the velocity and movement on his trademark sinker is improving. As for the trade package going to Baltimore, the deal closely mirrors what the Red Sox gave up to get Addison Reed last year, except that the Yankees headlined the trade with a top ten organizational prospect (Tate) rather than a top 20 organizational prospect because Britton is flat out better than Reed. One top ten prospect plus two fringe top 30 prospects rather than one top 20 prospect plus two fringe top 30 prospects. To be honest, I thought Britton would fetch more given the teams involved. Tate, 24, originally joined the Yankees in the Carlos Beltran trade two years ago. He’s missed time with various injuries (hamstring, shoulder, quad) in recent years and has a 3.38 ERA (3.76 FIP) with 21.9% strikeouts, 7.3% walks, and 48.1% grounders in 82.2 innings with Double-A Trenton this season. I ranked him as the team’s No. 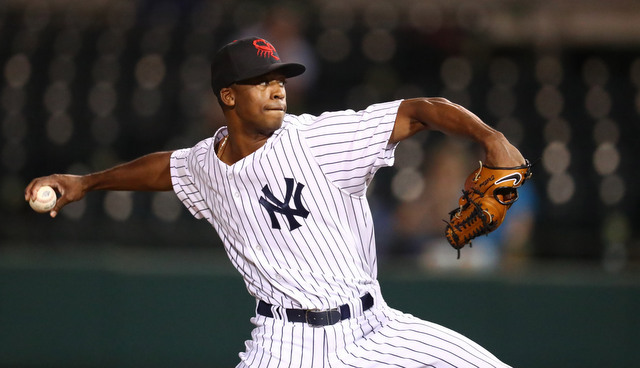 7 prospect in my most recent top 30 Yankees prospects list. 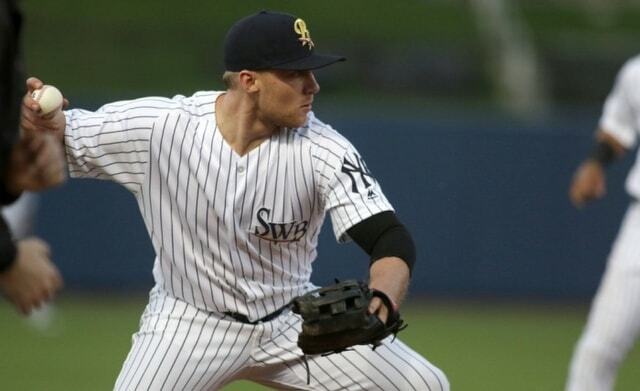 The 24-year-old Rogers and Carroll are both with Triple-A Scranton. Rogers was New York’s 11th round pick in 2015 and he has a 3.95 ERA (4.23 FIP) with underwhelming strikeout (17.7%) and ground ball (40.8%) rates. He’s a finesse southpaw who’s best case seems to be a poor man’s Jordan Montgomery. Carroll, a 22nd round pick in 2015, is a hard-throwing reliever with a 2.38 ERA (2.27 FIP) with 32.2% strikeouts and 10.5% walks this year. The Yankees have about 20 of those dudes in the system. It’s important to note all three prospects will be Rule 5 Draft eligible after the season, so the Yankees cleared out some 40-man roster clutter here. 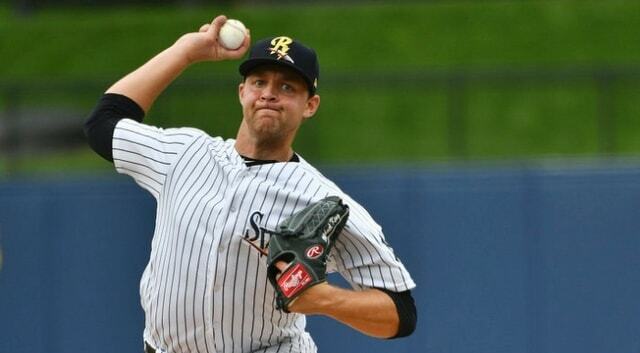 In fact, a few weeks ago I singled out Tate and Rogers as Rule 5 Draft eligible prospects who could be on the 40-man bubble this winter (Tate might be a reliever, Rogers isn’t a good fit for Yankee Stadium), making them candidates to be moved at the trade deadline. See? Sometimes I say something smart. Joel Sherman says the Yankees are taking on remainder of Britton’s $12M salary, which is roughly $4.5M or so. Last time I checked, they had about $13M in payroll space remaining under the $197M luxury tax threshold, so they can fit Britton in comfortably. There’s plenty of room for additional trade pickups and call-ups and waiver claims and whatnot as well. The luxury tax plan is still in good shape. Britton is an impending free agent and it is way way way too early to worry about what happens after the season. I imagine he’ll look for a closer’s job somewhere, in which case re-signing with the Yankees probably won’t happen. Perhaps he’ll fall in love with the team and the city, pull an Andrew Miller and accept any role, and re-sign as a free agent. We’ll see. Don’t worry about that now. For now, I consider him a short-term addition only. In all likelihood adding Britton is the first move for the Yankees before Tuesday’s non-waiver deadline, not the move. They absolutely need another starting pitcher and I’d bet the farm on them adding one before the deadline. Who? I’m not sure. But it’ll be someone. For now, the Yankees have upgraded an already strong bullpen (this might spell the end of Chasen Shreve), and there’s nothing wrong with adding to a strength. The Yankees are a better team now than they were before the trade. We are less than six weeks away from the 2018 non-waiver trade deadline and already the trade winds are beginning to blow. The Rays sent Denard Span and Alex Colome to the Mariners a few weeks ago, and the Royals have since gotten in on the act by trading Jon Jay to the Diamondbacks and Kelvin Herrera to the Nationals. The sellers are starting to sell. The Yankees, clearly, will be buyers prior to the trade deadline. Starting pitching is an obvious need. Adding a reliever could be worthwhile too. It is entirely possible other needs will pop up over the next few weeks as well. The Yankees have luxury tax payroll space and a deep cache of prospects, which allows them to buy basically whatever they want at the deadline. They can get anyone. While no player is ever truly untouchable, the Yankees do have some untouchables. Aaron Judge, Gary Sanchez, and Luis Severino are as untouchable as it gets and Gleyber Torres has joined that group as well. “Come on now. I’ve got to walk around this city,” joke Brian Cashman to Erik Boland the other day when asked whether trading Torres is a possibility. Even with those guys off the table, the Yankees have plenty of trade chips. Let’s take stock. Might as well start here. The Yankees reportedly made Miguel Andujar off-limits in trade talks over the winter and we’ve seen why so far this season. 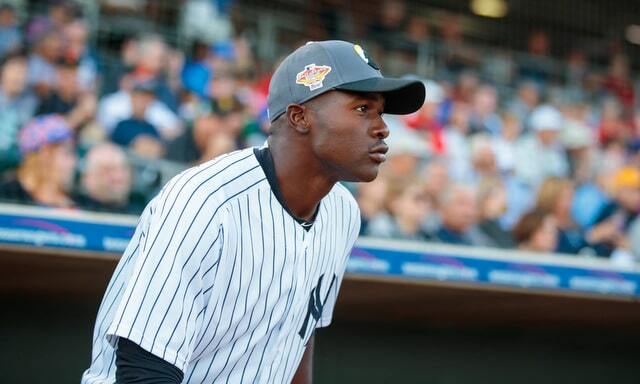 Even with a tiny little recent slump, Andujar is still hitting .290/.317/.519 (125 wRC+) with an 18.1% strikeout rate. A .229 ISO and an 18.1% strikeout rate is one hell of a combination for a rookie. We’ve also seen Andujar hit all types of pitching already. That said, should Andujar be off-limits? You could argue his trade value is higher right now than ever before because he’s had some big league success and is still so young with so much team control. Andujar’s probably never going to walk much and his defense, which is serviceable, might never be better than, well, serviceable. I’m not saying the Yankees should give Andujar away. I love the kid. I’m just saying he’s not as untouchable as Torres. Brandon Drury’s presence is the reason Andujar should not be untouchable. 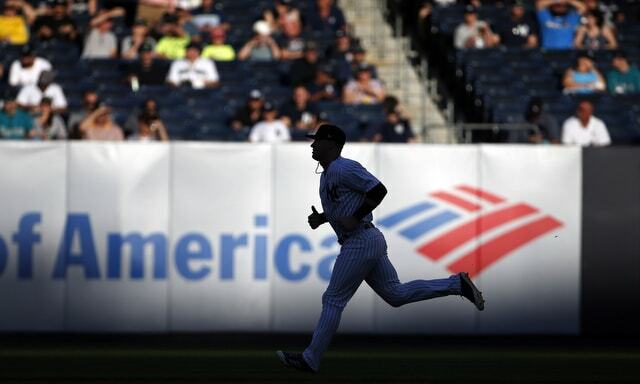 The Yankees have an MLB ready third baseman — their Opening Day third baseman, in fact — stashed in Triple-A. Drury is only 25 himself and, with another two weeks or so in the minors, his free agency will be pushed back one year. He’s hitting .360/.470/.529 (187 wRC+) with the RailRiders, and while that’s great, I’d expect a dude with two-plus years as an everyday big leaguer to wreck Triple-A pitching. That’s what Drury is doing. Ostensibly, Drury does not have as much trade value as Andujar because he’s a little older and doesn’t come with as much team control. He is very clearly a trade chip though. The Yankees can’t keep him in Triple-A much longer. I mean, they could, but at some point there are diminishing returns. I’m not sure Drury is learning much or developing new skills right now. We are fast approaching the point where the Yankees either have to trade him or call him up before he starts to stagnate. Among the guys we know the Yankees are willing to deal, Clint Frazier is the best trade chip. He’s 23, he’s been destroying Triple-A, he’s had some MLB success, and he’s not far removed from being a top prospect. The Yankees have a full outfield. As much as I would love the Yankees to get Frazier into the lineup on an everyday basis next year, they would be crazy to make him untouchable at the deadline. They reportedly offered him to the Pirates in a potential Gerrit Cole deal and he’s playing center field in Triple-A in what amounts to showcase. He’s available. Justus Sheffield is, by no small margin, the top pitching prospect in the farm system. He was said to be on the team’s list of untouchables over the winter, though pitchers break and have such a high attrition rate — Sheffield has some command issues himself — that it would be silly to make him off-limits. If the Yankees have a chance to add a quality young pitcher like, say, Blake Snell, of course you trade Sheffield. We’re all hoping Sheffield one day turns into Snell! So trade him for the real Snell. The Yankees won’t deal Sheffield for a rental. But a young guy with years of team control? All bets are off. A few months ago Estevan Florial would’ve been among the top chips. Right now he’s coming back from wrist surgery — a fairly common wrist surgery, but still wrist surgery — and his swing-and-miss issues still exist. Because of that, I think he’s more of a second tier trade chip right. I don’t think Florial can headline a package for an impact pitcher at the moment. I also don’t think the Yankees will move him while his stock is down, unless it’s a deal they can’t refuse. Many of the second tier guys are MLB ready or near MLB ready depth pieces. Tyler Wade. Billy McKinney. Chance Adams. None of them can headline a package for an impact player right now, but a deal for a lesser player? Or as the second or third piece in a larger trade? For sure. Wade is a legitimate shortstop and middle infielder with speed and those guys are hard to find. McKinney has a sweet swing and some power. I’m sure some teams still buy Adams as a starter. Good depth players who the Yankees can’t fit on the roster. Of course they’re available. Among their tippy top prospects, I get the sense the Yankees are more willing to deal Albert Abreu than anyone. He’s had some injuries — this year’s appendectomy is nothing, but last year he had elbow and lat problems — and while the stuff is excellent, the command is far from it. Between the injuries, the lack of command, and the distance to the big leagues (he’s in High-A), Abreu strikes me as a top 100 caliber prospect the Yankees would be very open to moving. He has a long way to go to be the pitcher he has the potential to be and the Yankees are in win-now mode. When you have a great farm system, you’re going to lose players in the Rule 5 Draft. There aren’t enough roster spots to go around and the system is designed to give blocked players an opportunity. The Yankees lost eight total players in the last two Rule 5 Drafts (four each year), six more than any other team. Seven of those eight players came back — Luis Torres is the only exception — but still. You don’t want to risk losing players for nothing. Two names immediately jump out as potential “trade them before you have to add them to the 40-man roster” candidates: Rogers and Tate. Rogers is the left-handed Littell to me. Great minor league performance to date, good pitchability, not blow-you-away stuff. I don’t think it’s crazy to worry his lack of grounders (39.9% in Triple-A) and lack of swings and misses (9.0%) won’t translate well to Yankee Stadium, even as a lefty. As for Tate, he was the fourth overall pick in the draft three years ago and he’s been very good this season, throwing 66.2 innings with a 3.11 ERA (3.38 FIP) at Double-A. You’d like to see more strikeouts (22.9%) from a dude with his stuff, but the walk (5.9%) and ground ball (50.8%) numbers are good. I wonder if this is a situation where his trade value exceeds his real life value. There’s a decent chance Tate is a reliever long-term. A good one, but still a reliever. Another club might view him as a no-doubt starter and fall in love with the whole “former No. 4 pick” thing. Regardless of what the Yankees do with Rogers and Tate — right now I’d bet on Tate being added to the 40-man roster and Rogers not, assuming they aren’t traded — there is going to be some roster shuffling in the coming weeks. A few of these Rule 5 Draft eligibles could be moved prior to the trade deadline or soon after the season. Aside from Sheffield, there’s no stud here that will net you an impact big league player. These guys are for depth moves or to fill out a larger package. Moreso than ever before, teams are taking very low level minor leaguers in trades. And I don’t mean low level as in not highly regarded. I mean the low levels of the minors. One of the prospects in the Kelvin Herrera trade was a 17-year-old in rookie ball. The second piece in last year’s Justin Wilson/Alex Avila trade was an 18-year-old in Single-A. 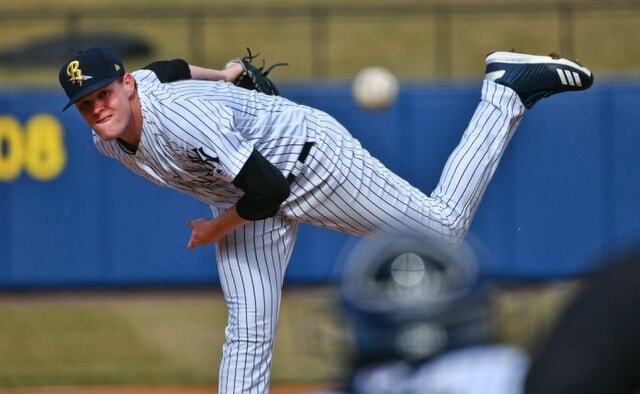 The Yankees traded 20-year-old Blake Rutherford last year. Teams are trying to acquire these talented young players before they break out into top prospects — the Yankees themselves have done this with the Nick Rumbelow trade (18-year-old Juan Then) and the Jake Cave trade (20-year-old Luis Gil) — and the Yankees have some of these players to offer, I think. Then is one. So is Saul Torres, Alex Vargas, Roansy Contreras, and Pablo Olivares. Guys like that are involved in trades more than ever before. Could Luis Medina, Everson Pereira, or Ezequiel Duran be trade chips? They’re all teenagers and they’re all on the cusp of becoming excellent prospects, but of course they’re trade chips. The Yankees are a bona fide World Series contender. They’d be nuts to let a teenager in rookie stand in the way of a win-now trade. I’m not saying they should give those guys away! But they have value and they’re in demand, and they’re so far away from the big leaguers that they can’t be untouchable. Trading players off your big league roster is not usually something a contending team does, but it is definitely possible. Neil Walker could go in a deal to offset salary a la Tyler Clippard last year, for example. I’d be surprised if the Yankees traded a reliever. I’d be even more surprised if they traded Sonny Gray, even in a deal for another starter. To me, the master plan is add a starter and get Gray on track, not replace Gray. Domingo German and Jonathan Loaisiga are on the big league roster right now — they’re not just on the roster, they’re making starts every fifth day — and they’re trade chips for sure. German has shown promising swing-and-miss ability and everyone loves Johnny Lasagna, but they both have scary injury histories, and if they can help the Yankees get a potential difference-maker, of course they’ll trade ’em. All of that is the long way of saying the Yankees have trade chips in all shapes and sizes. Once upon a time they were dealing from a pool of, like, three desirable prospects. Now they have pitchers, position players, MLB ready guys, far away guys, you name it. The Yankees can meet pretty much any asking price. That doesn’t mean they will. If the Yankees lose a bidding war this year, it’ll be because they don’t want to give up the pieces, not because they don’t have the pieces. LF Billy McKinney: 1-4, 1 2B, 1 RBI — really curious to see what happens with him … trade bait? Rule 5 Draft bait? added to the 40-man roster?